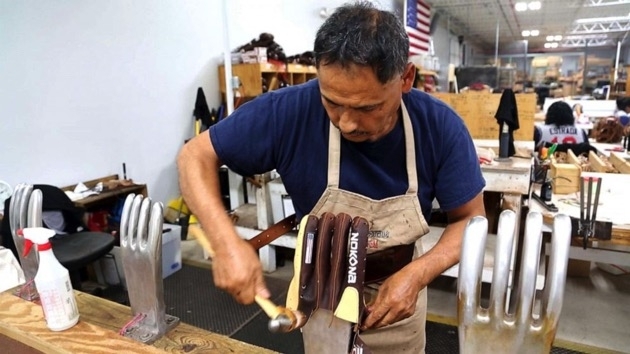 For four generations, a company in tiny Nocona, Texas, has been stitching baseball gloves by hand for America's greatest players — and it has no plans on letting up. A local banker, he started the company as a wallet-and-purse factory. When the Great Depression settled in, however, he began looking for a different focus to keep his leather company alive. In 1934, Storey’s grandfather, who had also played baseball at Rice University in Texas, made the company’s first baseball glove. That’s when Nokona Ball Gloves was born. The company, which now employs 50 workers, makes 150 baseball gloves a day. The gloves are worn by players on the Pittsburgh Pirates and Minnesota Twins, as well as the Kansas City Royals. The domestic leathers that the company gets predominantly come from Texas, Kansas, Oklahoma and Nebraska. The domestic leathers are tanned in Milwaukee and Chicago, where most of the old tanneries originated, according to Storey. “We’re always striving to use the best possible leather to make the best possible glove for the fit that we need,” Storey said. Gloves start at around $225. The company is also a family affair for some workers. Employee Brandy Claxton said customers were often surprised that the company made the baseball mitts by hand. Jeff Beraznik, Nokona’s president, said the quality and attention to detail made the company’s gloves different. “We can make good business decisions and make sure that Nokona is in a solid financial position for the future and a big part of that is that secret weapon of being made in America,” Beraznik said.